Organizing a work space goes way back to the industrial revolution when managers were trying to find out how to make their workers more productive. Initially, the goal was to reduce injuries, but over the years we’ve learned that carefully organizing your work space can improve productivity (Resnick and Zanotti, 1998). More than just improving productivity, when you personalize your work space, studies have shown you enjoy work more, you work harder, and you have a greater sense of “organizational well-being” (Wells, 2000). 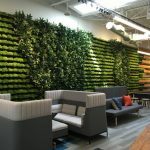 In this article, we focus on three elements that will help you decide how to design your work space for productivity: pain reduction, stress reduction, and personalization. It seems kind of obvious — if you’re in pain, you won’t be as productive. But you may not even realize that your work space may be the source of your pain. Back pain, headaches, sore wrists and forearms are just a few symptoms that can crop up if you don’t have your work space set up properly. Back pain, for example, can be caused by poor posture or a cheap office chair. Think about how much time you spend in that chair. Likely, it’s more than 20 hours per week. It’s worth the investment to get a chair that properly supports your body. If you work from home or your employees do a lot of brainstorming, consider including a lounge chair space and a table with comfy chairs for collaboration. On the other hand, if you’re standing most of the day, you may need to consider a floor mat or thick rug. The following TBWA Hakudo office has the perfect location for pacing without strain on the knees or lounging to gather inspiration. Headaches can be caused by issues with lighting or your monitors. Too much light can cause eye-strain and some individuals are allergic to incandescent lights found in most offices. You can also reduce headaches by increasing the refresh rate on your screen, which is easier on your eyes (ask your tech department if you don’t know how to adjust this yourself). Sore wrists and forearms are often caused by typing too much. Since typing less is probably not an option, you can try an ergonomic keyboard. It takes a little getting used to but can dramatically improve the comfort of typing. You may also consider an updated mouse as older models take a lot more pressure to click on the buttons. Stress is another major factor that is often easily reduced by designing your work space for productivity. In crowded offices, a key contributor to stress is a lack of personal space. Look for ways to create space like putting up dividers between people or arranging desks so that your back is to the back of someone instead of facing them. Below is an example of an excellent set up, from the offices of Creative Studio 3fs, in which employees have a private space without dividers. Most people prefer outdoor lighting rather than indoor lighting. When practical, arranging work space to allow staff to be exposed to light from outside can dramatically reduce stress. When you can’t afford to give everyone a window seat, consider allowing adjustable lighting as some people like it darker while others prefer lots of bright light around them. When all else fails, using quality lights can make a huge difference and is far less expensive than upgrading to individual lighting systems. The following office from Wonderfactory provides a nice balance with light yet decorative walls, nice amount of lighting, and extra lamps for employees who need more light at their desks. Acoustics also play a big part in work space stress. If you work in a noisy office, consider adding rugs, acoustic panels around desks, or replacing the ceiling tiles with sound absorbent systems. Consider moving the loudest workers away from other staff. Upgrading to headphone systems can help by keeping hands free for typing, while also making it easier to adjust the volume on the phone. Sound levels can be a major irritant for some staffers, so finding functional ways to reduce the sound levels can make a major impact. Being able to personalize your work space to make it feel more like your own area with your own individual touch has been a proven method for improving productivity. While some managers frown upon too much decorating, the fact remains that people perform better when they feel they have created their own space. 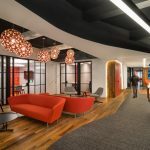 A personalized work space reduces stress and makes the staff feel more connected to what they are doing and the organization as a whole. Small decorations can go a long way. Family photos, inspirational images and quotes, seasonal decorations, educational achievements, and awards are all little things you can use to personalize your space. You have to know what makes you tick, what hurts, and what helps keep you focused. Once you understand what may be holding you back or what could be pushing you to perform better, you can begin designing your work space for productivity. When thinking through any changes, just keep in mind pain reduction, stress reduction, and personalization, and you are sure to be well on your way to a more productive work area. Resnick, M. L., Zanotti, A. (1998). Using ergonomics to target productivity improvements. Computers and Industrial Engineering. 33, 1-2. Wells, M. (2000). Office clutter or meaningful personal displays: The role of office personalization in employee and organizational well-being. Journal of Environmental Psychology. 20, 3.